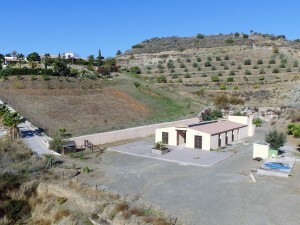 Impressive Finca completely renovated with modern style, 2 guest houses and excellently situated on a plot with 100% privacy, tranquillity and panoramic views. Ground floor: Large entrance porch with beautiful open views with access to the interior of the house where we find a large fully equipped kitchen with high quality appliances with seating area and open views to the outside. The living room is very spacious and bright with fireplace and access to another glazed porch. Guest toilet. Upstairs: We find a luxurious master bedroom with en-suite bathroom with views to the outside and large shower room, more spacious dressing room (all with direct access to the large sunny terrace with panoramic views). In this floor there is also a second bedroom with fitted wardrobes and bathroom in suite. Guest house 1: located on one side of the plot with much independence and privacy to the main house and is distributed in an elegant living room with open kitchen and equipped with access to a beautiful sunny terrace. Bedroom with dressing room plus bathroom with shower. 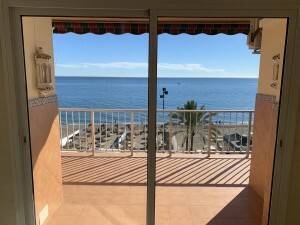 There is a large solarium by which you can access by an external staircase from where you can enjoy great views. On its side there is also an ideal area for barbecues. Guest house 2: Located at the other end of the modern Finca with a spacious living room with open kitchen and equipped plus bathroom with shower. This beautiful studio has a large front terrace plus a roof terrace. The 3 buildings have been recently refurbished with high quality materials with polarized windows and safety glasses, air conditioning hot/cold and also in the main house there are under floor heating on the 2 floors. Exterior: Entrance of vehicles with automatic gate with parking capacity for several vehicles plus carport for 4 vehicles. The infinity pool is located in the centre of the 3 houses with 100% privacy and panoramic views of the countryside and mountains with sunny terraces all day. The plot is completely fenced with innumerable olive trees and the garden in perfect condition is very picturesque and easy to maintain. The Finca has drinking water from the town hall. Plot 11.146m2. Total built size 344m2. Main house 253,40m2. Guest house 40,10m2, porch 13,55m2 and 40,10m2 terrace. Guest house (studio) 24,05m2 and a terrace 24,05m2. Laundry 12,90m2. 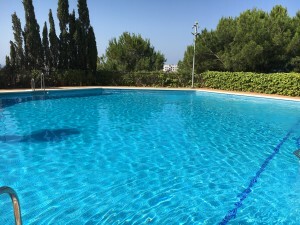 Swimming pool 38,70m2. Rubbish 76? per year. IBI 208,85? per year. Alhaurín de la Torre 11km.